War Is Boring published an earlier version of this story on Dec 15, 2014. In 1981, an American writer sneaked into Afghanistan following a dream. He survived — barely — and wrote a play that eventually became a movie. The Beast, which debuted in 1988, is about a Soviet tank crew that finds itself all alone in hostile Afghanistan. It’s a masterpiece — one inspired by a terrible, terrible war. The Soviet Union invaded landlocked Afghanistan in 1979. The campaign would last eight years and kill nearly 15,000 Russians … and more than 80,000 Afghans. At the time of the invasion, New Jersey native William Mastrosimone was 34 years old and a playwright. He had graduated from Rutgers University a few years before. He didn’t know much about Afghanistan. In 1980, a New York City theater staged his first play. The Woolgatherer is a dark comedy about two desperate people searching for love in South Philadelphia. Critics and audiences loved it. “It was the first time I made a living as a writer,” Mastrosimone tells War Is Boring. One day during rehearsal, Mastrosimone grew restless. “I got to walking around and reading The New York Times,” he says. He noticed a picture of an Afghan tribal leader and read the accompanying interview. The obsession affected his sleep. “When I’m really hooked on something — on an idea or a script or a story — I dream about it,” he says. One night, he awoke from a dream and scribbled a drawing on the back of a yellow legal pad. One problem, Mastrosimone had no idea how to get there. 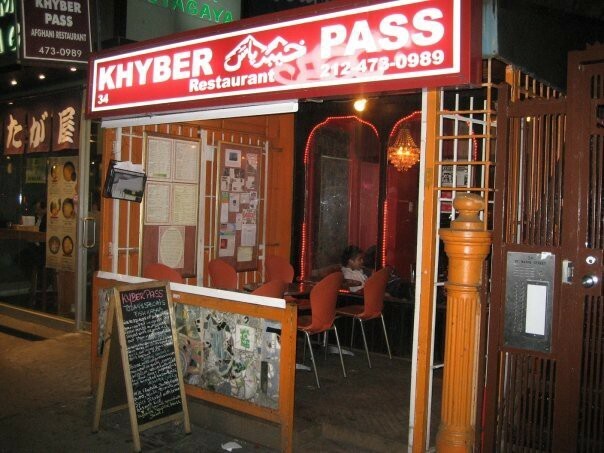 “I went to this restaurant called the Khyber Pass,” Mastrosimone recalls. The Lower East Side restaurant serves traditional Afghan food. It’s still there. The waiter told Mastrosimone to call a travel agent. In other words, he blew him off. He didn’t give up. He returned to Khyber Pass over and over again until one of the waiters broke down. The Afghan explained that the staff thought Mastrosimone might belong to the CIA or the KGB. Either way, they didn’t trust him. To prove his story, he invited two of the waiters to watch his play. They weren’t convinced until they saw a six-foot-tall marquee advertising the play. It was a giant copy of The Woolgatherer’s review in The New York Times. The two Afghans explained to Mastrosimone that they didn’t feel Afghanistan was getting a fair shake in the media. The Soviets were murdering their people and America didn’t care. “That was my real ticket to Afghanistan,” the playwright says. Mastrosimone wanted to know how long he would need to wait in Pakistan. The Afghan told him he didn’t know. He would get there when he got there. It was an incredible leap of faith. “There were times I really thought the guy made a fool of me,” Mastrosimone says. But the man rewarded his faith. He met Mastrosimone at the hotel, just as he’d promised, and put the American on a train. “They wouldn’t even tell me where it was going,” he says. The train stopped in Peshawar and Mastrosimone knew — again — that his contacts hadn’t jerked him around. Before the group crossed the border, Mastrosimone needed to jump through one more hoop. Mastrosimone wanted to know why. His contact explained that they needed permission to enter the country. The warlord was Gulbuddin Hekmatyar. Hekmatyar is one of Afghanistan’s most controversial figures. In his youth, the warlord studied engineering at college in Kabul. His university career ended after he murdered a fellow student. He grew in prestige and power in the years leading up to the Soviet invasion. He was one of the warlords the CIA counted on to supply the mujaheddin with weapons and ammunition during the war. Hekmatyar spoke halting English. Mastrosimone knew only a few words in Pashto. “All he wants to talk about is America and politics,” Mastrosimone recalls. “And he liked me. He sent for food.” The two sat and talked for hours before Hekmatyar allowed Mastrosimone to leave. It wasn’t until the playwright returned to the U.S. that he discovered just how dangerous the warlord really was. Hekmatyar granted the group his permission to enter Afghanistan and assigned two guards to Mastrosimone. They sneaked across the border with vague plans to connect with some people running arms to Afghan fighters. For the first time, the reality of the war hit the playwright. “Do I belong here?” He asked himself. The next morning, Mastrosimone woke up scared yet determined. Then he learned what had happened during the night. It’s a tactic familiar to American veterans of Afghanistan. After the fighters disabled the Russian vehicles, they rushed the tanks and took 11 prisoners. Mastrosimone’s handlers knew he was there to write about the war, so they offered him an interview with the Russians. One of the mujaheddin spoke Russian. He’d translate to Pashto then the playwright’s contact would translate to English. But something bothered Mastrosimone about the interview. “When I’m done with my questions, then what?’” he asked his contact. Mastrosimone knew he was in trouble. Some of the Russians realized their only hope lay in the strange Westerner standing in front of them. “They were all really young,” Mastrosimone recalls. Mastrosimone told his contact that he didn’t want anything to do with the Russians. His handlers were angry. They tried to force him to talk to the Soviets. They chastised him. “What did you think we were doing here?” one asked. So began his first day in Afghanistan. “I was never in the military,” Mastrosimone says. The group hooked up with a convoy of pack mules and horses loaded down with supplies and other ammunition. Hekmatyar’s guards returned to their warlord. The physical toll of walking through the harsh country began to wear on Mastrosimone. The group worked their way through the Hindu Kush Mountains. He had trouble keeping up with his contact. “These guys, from birth, go barefoot walking in the mountains,” he says. They took water and food where they could. One evening, the group drank water from melting mountain ice. The next morning, Mastrosimone couldn’t get up. Mastrosimone explained that he couldn’t get up. His strength was gone. His contact conferred with the other members of the convoy and returned to the playwright. Mastrosimone was confronted by what he calls the fatalism of Islam. “I’m looking at the peaks of the mountains covered with snow,” he recalls. Mastrosimone lay on the ground in the middle of a mountain pass, contemplating his death. “I was absolutely calm because I was so angry at myself,” he says. He says he has a tendency to get in over his head. On that mountain in 1981, he thought it was the last time he’d have to deal with that problem. The playwright had no food or water and could barely move. He rolled to an alcove on the side of the mountain. “My first instinct was to get out of the wind,” he explains. There, he slowly used the last of his strength to wall in the alcove with rocks from the path. His makeshift hovel complete, he passed out. He woke up later when the sun cut into his eyes. Suddenly, the sun was gone and he saw an eye. A small boy bent down next to him. The boy thought he’d discovered a sleeping Russian and he called for help. It turns out a small village stood at the top of the mountain. The boy went and gathered the people of the village and they all came to inspect the sleeping Russian, and probably to kill him. Luckily, one of the villagers spoke English — and that spared Mastrosimone a grisly death. The English-speaker was a doctor named Mohammed Mohammed. He was a dual citizen of England and Afghanistan who spent a few months out of the year back in his home village, using the medicine he’d learned in the West to help his people. He chastised Mastrosimone for drinking the mountain water and told him he had all kinds of things wrong with him. The doctor told the woman the American could only eat yogurt and drink green tea. He was still a few days away from handling a hearty soup. She promised to make him soup when he felt better. She made good on that promise. “It was a fantastic soup,” Mastrosimone says. He asked Mohammed what was in it and the doctor didn’t know. There was some kind of meat in it that neither could identify. “That soup really picked me up,” Mastrosimone says. “It made me feel strong.” A few days later, he felt well enough to explore the village. He found the old woman outside of her hut, sweeping. On a tree next to the hut, a goatskin dried in the sun. A week into his recovery, Mastrosimone’s contact came back through the mountain. He was happy to see the playwright alive and well. A lot of people would be furious if their handlers left them half-dead on the side of a mountain. Mastrosimone was not. He laughs as he recalls the reunion. His contact was on his way to Pakistan, but Mastrosimone was still too weak to travel with him. It was a few more days before the playwright could walk long enough to make the journey back to Peshawar. Before Mastrosimone left for Afghanistan, he had written a first draft of the play Nanawatai, about a Soviet tank crew and its desperate battle with the mujaheddin. “I wasn’t sure if I’d ever come back,” he explains. When he got home, he knew exactly what to do to fix the first draft. He rewrote the play. It played in Norway and Los Angeles. Director Kevin Reynolds contacted him. Reynolds said he could imagine Nanawatai as a film. Mastrosimone agreed and adapted his stage play into a screenplay. He called it The Beast. Reynolds and Mastrosimone began filming it for Columbia Pictures. Halfway through production, ownership of the studio changed. The new executives weren’t interested in Mastrosimone’s take on Afghanistan. Sylvester Stallone had approached them with an idea for Rambo III, another film set in Afghanistan that the execs at Columbia thought had a better chance of making money. Just like that, they buried The Beast. To meet a contractual obligation, Columbia released the movie in two theaters in New York City and Los Angeles. The movie ran a few weeks and withered away. That’s not the end of the story for The Beast. Mastrosimone has gone on to have an incredibly successful career. He’s written more plays and screenplays for television and film. He’s won Emmys. But he still thinks about The Beast and Afghanistan. Thanks to home media and America’s renewed interest in Afghanistan, the film finally is getting its due. There’s no better American movie about Afghanistan. Slowly, steadily, it has become a cult classic. And in Afghanistan, it’s a smash hit. Mastrosimone attributes the film’s success to director Kevin Reynolds. I say that the power of The Beast comes from the writer and his experiences in Afghanistan. Mastrosimone’s deep empathy for both the Afghans and the Russians is evident in every frame.